Below are some of our parent testimonals. Gracelands is a place full of beautiful people who nourish my kid. Teachers are always cheerful and loving, my daughter cannot stop mentioning them and what she did during the day. I particularly like the animal patch and the vegie garden, and that the centre use the produce for their cooking and educatethe children the fact about our nature. At last, I have to mention that Gracelands has their own cookwho makes up a delicious menu (better than our canteen) that Tara always said she had a second. Thank you very much for giving Tara the best memory in the last 2 years in Gracelands and she turns out to be a very active and confident little lady. 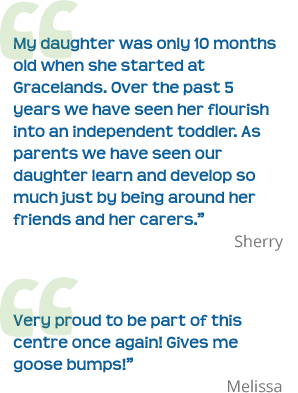 Gracelands has a genuine nurturing and caring environment for all it's children - mother Vanessa. We just wanted to say a huge thank you for all your hard work at tonight's concert. It's so evident the professionalism and dedication you all have to your work and this is seen in tonight's performance.We are so grateful to all of you for giving up your time and putting on such a great night. Our parents, who came with us last year, were amazed at how smoothly tonight went. The food and drinks were flowing and there were plenty of seats! My name is DJ, father of Sebastien, and will gladly give some feedback. Sebastien’s mother is a Leader of Learning in the field of Education. I see what she puts into her work with helping the kids to learn and the patience shown in times when children are not behaving as expected. I respect that the staff at Gracelands also have these same qualities and as the children are younger, they may need a little more patience. 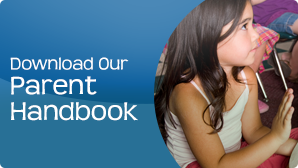 Sebastien always gives reports on what he does at school and was very excited when it came to School Readiness. He is always happy to do his homework and excited to go when Mondays and Fridays come. He is also forever telling us lunch at school was so delicious that he had two or three servings and he certainly does not eat like that at home. The main thing I could say is his fondness for his teachers in the Wise Owls. I am sorry I do not know all of their names but I certainly know the faces. In fact, we still call Milk Arrowroot biscuits ‘Miss Bee bickies’ which is something he picked up three years ago. The Gracelands staff are very much an extension of us in helping groom Sebastien for the future, and we are certainly happy with his experience that our next child too will also start at Gracelands next year. Thank you for the opportunity to be a part of Gracelands’ Childcare Week yesterday. I loved meeting the Wise Owls and I hope they liked their session too. My Mum also had a ball with her pikelets and Noah was a good boy and enjoyed his lunch too – thank you! I’d like to particularly give praise for Miss Judy, Miss Shannon, Miss Ash, Miss Shadi and Miss Sarah in the Gumnut Babies room – seeing these women work so hard and so well as a team yesterday was very impressive. They seamlessly juggle baby wake-ups with nappy changes and everything in-between and stay so well-humoured and energetic. It’s a fantastic team, you should be proud. Please pass on my thanks to them all. 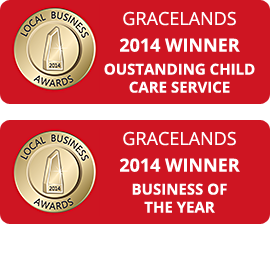 Congratulations, Gracelands is more than deserving of both titles. Mikey and Izzy love coming to Gracelands and really get the most amazing care and education from their educators. I could not possibly imagine sending them anywhere else. I have recommended Gracelands to many of my friends and will continue to recommend your centre to family and friends for years to come. With Izzy starting big school next year we are going to miss the educators in the Wise Owls room, but thankfully it wont be a full goodbye yet as Mikey will still have 1 more year at the centre. From entering the centre with the always friendly and approachable Megan, Charmaine, Liz and Joe, to the wonderful chef Julie, then going into the children's rooms with the delightful, warm and caring educators. It is always a pleasurable experience (even if your child is having an off day! ).